I used multiple layers on the background with some stitched border dies & I hid the lower portion of the circle below the layers, but I think it's pretty close to the sketch, below. See the instructions below for more details. Thanks for joining us for the launch of this stamp set - please stop by the Facebook page and join the Sketch Challenge! Hope your Saturday is great and that you take some time to do what makes you happy! Stamp the Tulip image onto smooth white cardstock with Memento black ink and color with Spectrum Noir markers. Color in some grass under the pail, then cut with the stitched rectangle die. 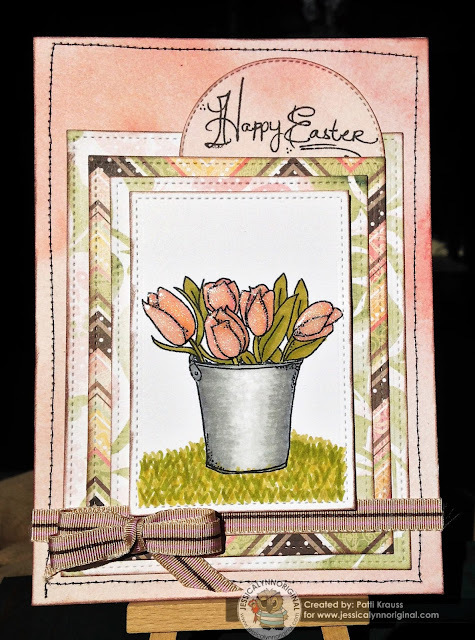 Add some shimmer and dimension to the tulips with the Glitter Brush pen, some Glossy Accents, and a touch of ultra-fine glitter. For the card base, cut the bottom panel from the Porcelain papers to fit the A7 card, then stitch edge with sewing machine. Cut 3 successive sizes of panels from the paper pack, so that you have a total of 4 nested sizes when you include the focal image. Cut a stitched circle from the papers, then stamp the Happy Easter Sentiment towards the top. 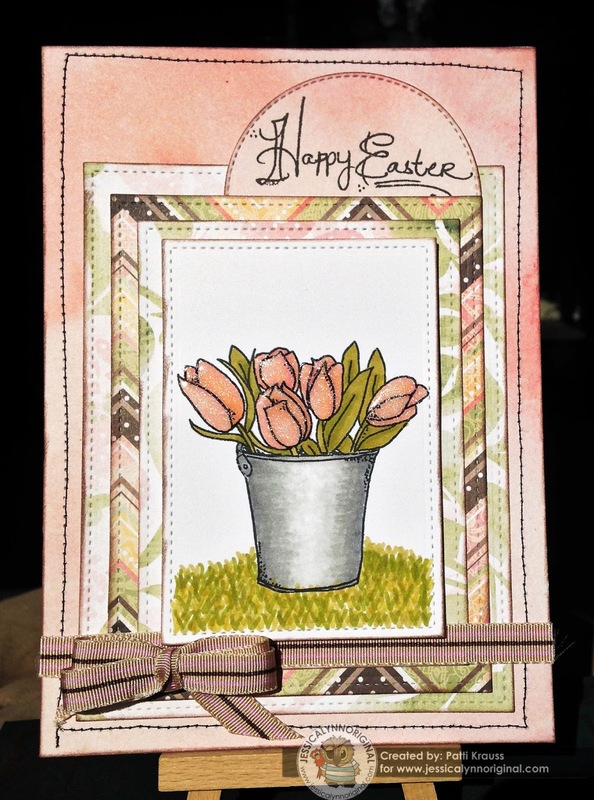 Ink all edges, then layer the patterned papers onto the card base, placing the sentiment circle under one of the layers. Add the focal image with craft foam, then finish with some ribbon and a bow. Wow! This is gorgeous! Love your use of colors.